From the sky above, I can barely see the dried up wadi, instead I follow the trees and green shrubs of its watershed and tributaries as we leave Goz Beida heading to Abeche, then off to Gaga and Farchana. We pass a massive flood plain with splinter-like rows of green extending across the plain. The southeastern Chad is much greener but still there is an abundance of sand. Camp Djabal looks more dense then Kounoungo did from our plane, the trees and saplings that line the washing areas, small living quarters and surrounding the camp itself, again, make it look like a village from here. I want so badly to make it to Gaga and Farchana. Not another day without visiting the camps. Without speaking to the people and holding the hands of small eager children. There is one woman in particular that I will be looking for in Farchana. I have watched her in the videos with both Stacey and Connie. She is one of the Massaleit that bears the three scars in each cheek, a sign of womanhood and experience. 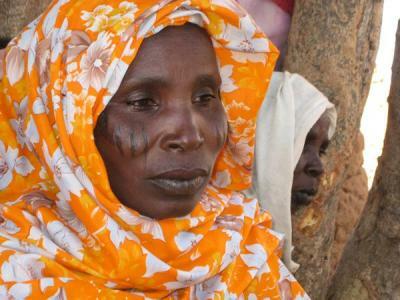 Her husband died in Darfur during the attack on her village. She has several small children. In the last two visits that we have made here, we have never remembered to write down her name. If you have seen the cards that we have made with a picture of Mansur, Leila or Fatma, then you know who I am talking about. She is the 4th card that we made, the woman with the orange and white head scarf. I don’t know why I am drawn to this woman in particular. Farchana is a large camp of almost 20,000 and I am almost positive that her story is similar to many others. Each time I see her picture or watch the videos from i-ACT Dec 2006 and July 2007, I see sadness in her eyes. And I see experience beyond her years. I am intrigued to hear more of her story. To sit with her for hours, to follow her through her daily routine, and help when I can. I know that with only three days in Farchana, many stories to collect, over a 100 canvass tiles to be drawn on by kids (in an orderly manner? Say what? ), I know I will not have the time I will want to talk with her. The bumpy unpaved road brings me back to the present. Squished against one window behind Elfa, our driver, I feel lucky not to be in the middle like Gabriel and Jeremiah. We honk at every corner and at every animal to scoot over on the road. We pass three checkpoints, only one asks for papers – we are fortunate that EVERYONE knows both Elfa and Bouba! At one point we follow a heavily armed tank with an even more heavily armed truck following us. We joke about being literally caught in crossfire as we pass that area where just last month rebel forces and government troops challenged one another. The sun sinks behind the mountains as we pull up the ever familiar blue UNHCR gate. They aren’t expecting us? C’est le vie en TChad! Thank you for your gorgeous message – and you are very, very welcome! Now for one of my musings! This one regarding the lady in the Camp – whose name is (as yet) unknown. I think it is the most natural, beautiful thing to be so drawn to her in particular – regardless of the knowledge that “her story” will no doubt resemble or match that of so many in the Camp. The reality is that you have HER picture and to truly honour her, to make HER story known, it seems odd not to know HER name…… particularly when you can see so much of her experience reflected in her eyes. There is an incredible intimacy in that – looking into the eyes of another. Take care ….. and you all look so well. Her eyes are so telling. When I met her I kept thinking about your line – Fatna is what her husband use to call her. We saw her again today and will see her again tomorrow, our last day in Farchana. She was smiling a lot today. She is so beautiful. When I begin to think about what she has endured it makes me really sad. Sad to think that she is still in the same situation as she was when she was forced to flee her village. I can feel it in my chest now that I am back at UNHCR’s guesthouse reflecting – but when I am there with her, I just look into her eyes and see the strength. Too bad you don’t have Oumar and his friends to help you locate the Massaleit woman you hope to ask her name and so much more. Perhaps with the spirit of connection you’re feeling, SHE will find YOU! We’re looking forward to sharing the new bonds you will make in Gaga and Farchana camps, and seeing the reunions with friends of prior trips. Please tell J & J we enjoyed hearing of their first impressions in the camp, and look forward to their journals. Yes, if only we can get a strong push going for education . . . or at least a firm foothold in the process. We’re behind you on your impassioned efforts. Keep bringing the Darfuri messages home to us so they’re not strangers. We all need to see their faces and hear their voices — it’s much harder to ignore a friend in need. I definitely called the window seat and since we have tried several different seating arrangements in the short rides to and from Farchana, but we all agree that Josh and I should sit on the outside! We had limited choice in our driver who turned out to be great. And we just found out its Alpha! Bouba was at the airport in Abeche to help with permits and he wasn’t going to be available, but we lucked out! We interviewed a few more, but Bouba rocks! We found Fatna fairly easily! I hope you enjoy the entry and video from today! You are always with me! We owe most of the fact that we didn’t get caught at sundown out on the road to Alpha! And he even lets me drive the car! Wahoo! I think you were drawn to this woman in Farchana exactly because she is the face of the other thousands of woman in the camps and she represents the horrors they have all had to live through. Same way we have all connected to the faces we are introduced to like Leila and Mansur, Adam, Ouamr, and Ahmat (from i-ACT 1). By the way, any news on Ahmat? No news on the Ahmet front. We just ran out of time with the local authorities being so strict in Kounoungo. I hope we find his family in March when we return! Love you forever, like you for always. Forever and ever my Grammie you’ll be! I can feel your love and protection from here. Hi Gabriel, its amazing to me or us to see you guys in the videos and then walk over your house and pick up Rafa playing with Gabe talk to Sahara,… our lifes are so peaceful and good our kids so safe i feel like crying when i think about the families there. Im sorry, we are praying. I get to emotional sometimes, be safe. Thank you for your note and for being emotional. I feel like you do, that it is so strange to be able to go home to our comforts and then have on the back of my mind the images of all of these people here feeling abandoned by the world. There is so much we need to do for our neighbors, even if they live a little far. Big hug to Rafael! Nice to see you all tightly connected and in tune. Looking forward to the reunion with more friends, especially Mansur and Leila. Please let them know that the response from the T-shirt and flyers of awareness have all been moving. Mansur was not there to receive the t-shirts but his mom seemed very excited! The many messages of hope from America bring joy to the families and children we show them to!